LMU’s Enrique Jiménez, a specialist in the literature of Ancient Babylonia at LMU, has initiated a research cooperation with colleagues at the University of Baghdad. The research group “Electronic Babylonian Literature” led by Professor Enrique Jiménez at LMU’s Institute of Ancient History has embarked on a collaborative project with scholars at the Department of Archaeology in the Faculty of Philosophy at the University of Baghdad. The LMU group is devoted to the conservation and reconstruction of the surviving corpus of literary texts from ancient Mesopotamia, and the purpose of the agreement with Baghdad University is to conserve and digitize a selection of the cuneiform tablets held by the National Museum of Iraq. In the coming years Dr. Anmar A. Fadhil (College of Arts, Baghdad University) and Enrique Jiménez will publish the literary texts from the famous Sippar Library, which was unearthed in 1986, but very few of whose texts have been edited since. The library includes previously unknown manuscripts of the Babylonian Creation Epic, the Story of the Flood, the Poem of the Righteous Sufferer, and many other literary works that have not been read since Antiquity. Carmen Gütschow, an expert on the conservation of cuneiform tablets collaborating with the LMU team, has already been working in the Iraqi capital, together with colleagues from the University of Baghdad and the National Museum of Iraq. Her task is to reassemble and restore the most significant literary works in the Sippar collection, and to train two members of the museum’s staff as conservators. Most of the surviving Babylonian texts have come down to us in fragmentary form. 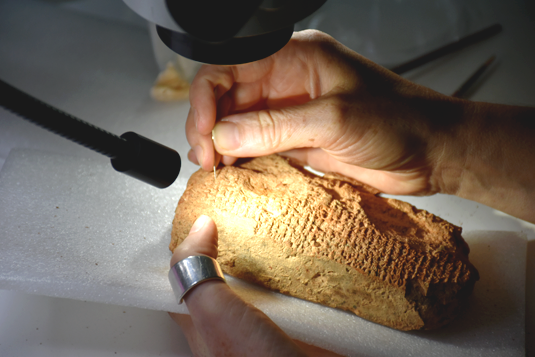 Museum collections all over the world hold large numbers of fragments of cuneiform tablets. Since the signs in the cuneiform writing system are polyvalent, their correct interpretation and subsequent identification often depends on the context. This fact makes the interpretation of fragmentary passages, in which the signs are devoid of context, particularly difficult. The greatest challenge in the reconstruction of the Babylonian texts therefore lies in identifying fragments that belong together. To solve these problems, the “Electronic Babylonian Literature” group intends to develop algorithms for automatic matching of related text fragments.